Ten thousand camels will be fluttering their long eyelashes in a unique international beauty pageant being held in the United Arab Emirates. The contest in Abu Dhabi is one of the richest and biggest events of its kind, with more than $9m (£4.5m; 5.8m euros) and 100 cars in prizes up for grabs. The contest will feature camels or "ships of the desert" from Bahrain, Kuwait, Oman, Qatar and Saudi Arabia. Organisers hope it will remind Emiratis of traditional desert values. The contest is part of the Mazayin Dhafra festival, which starts on Wednesday, and organisers say it is the biggest contest of its kind to be staged in the Gulf. A panel of expert camel appreciators will choose the best animals for each age group. Entry is open to anyone who can prove ownership of a pedigree camel, and the animals must be free from contagious diseases, and without any serious defects. The ruler of Abu Dhabi, Sheikh Khalifa bin Zayed, has sponsored the event. It is said he wants Emiratis to help preserve their national identity through the respect of an animal central to Arab culture. 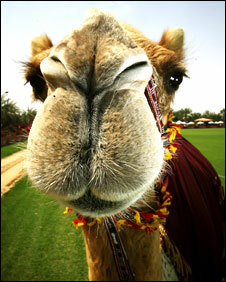 The first camel beauty contest in the UAE took place six years ago. Camel racing is a popular sport, with money from the region's oil riches often placed in huge bets. Long before the oil industry moved in, the Bedou tribes prized the animal known as the "ship of the desert". Camels were the main measurement of wealth, along with horses and falcons.